Although I don’t make huge efforts to hunt down restaurants run by contestants of the TV show Top Chef (in particular the winners), I’ve hit a few of them including Star Noodle in Lahaina (by Sheldon Simeon). 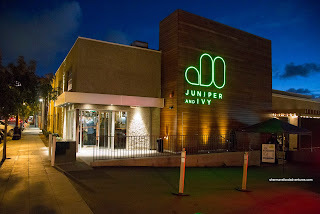 Since Viv and I had one day in San Diego after our Mexican Cruise aboard the MS Westerdam, we made reservations for Top Chef All-Stars Winner Richard Blais’ Juniper and Ivy in Little Italy. We've always been a fan of Richard Blais, especially his creativity and attention-to-detail. 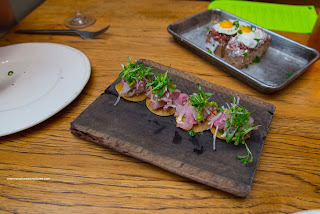 Reading more like a tapas menu, we decided to get 6 items to share starting with the Cruda Carne Asasa Toast. 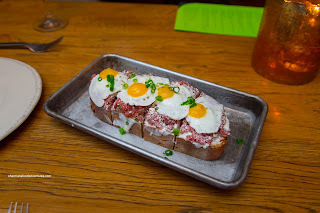 When it arrived, the portion size was more than I had envisioned, Sitting atop a thick piece of bread, the tender and nicely-seasoned tartare was already buttery, but the addition of a fried quail egg on each quarter segment made things messy and tasty. Next up, we had the Yellowtail Snapper Crudo served on top of mini-tostadas. The bright and fresh snapper was moist and soft while spiked with pickled ginger. We enjoyed this dish, but thought the toast was more interesting in comparison. In a surprising twist, my favorite item had to be the Smoked Sunchoke even though it contained no meat. 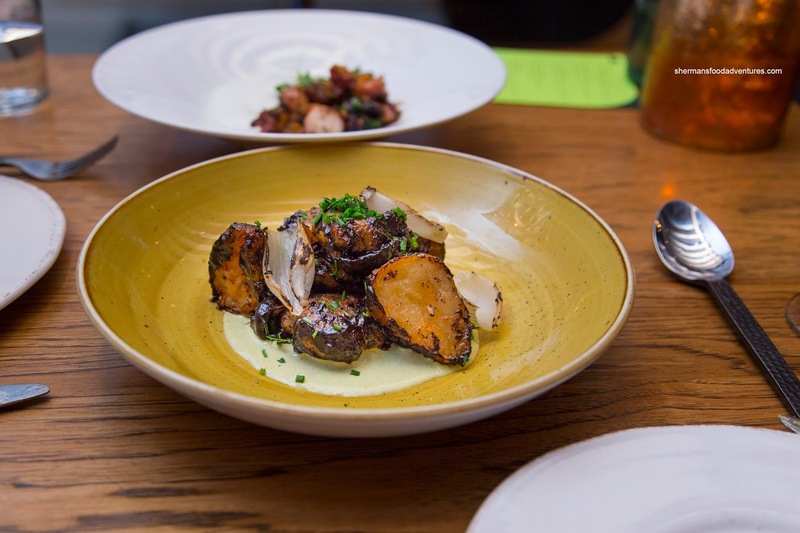 This was achieved by tossing the robust sunchoke in a black garlic BBQ sauce atop fermented onion foam. The result was an explosion of umaminess that was supplemented by intense sweetness, a touch of saltiness as well as smoke, tang and Earthy flavors. 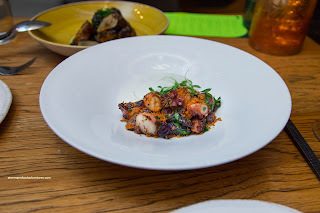 Almost equally delicious, the Octopus was tender, yet at the same time, was appealingly chewy. It was sauced in a mildly-spiced sauce while the crunch on top added a complimentary texture. Arriving underneath a glass dome, the Buttermilk Biscuit was presented in a cloud of smoke. Hence, the smell already suggested what we were in for in terms of taste. We opted for the foie gras butter on top which was creamy and only slightly gamy. 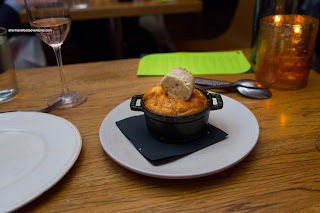 It was sure decadent though as it melted over the soft and fluffy biscuit (that was more cake-like). Loved the crunchy sweet crunch of the top as it went well with the butter. 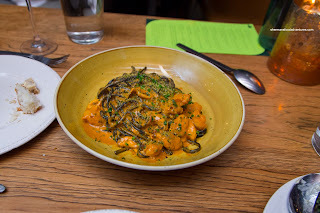 Our last savory dish was the Squid Ink Linguine which was prepared a firm al dente. This was very well-executed for a freshly-made pasta. The shrimp, mussels and calamari were completely on point with the desired textures. They also added a sweet brininess to the creamy rose sauce that coated each strand of linguine perfectly. 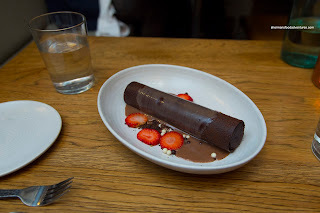 Lastly, for dessert, we had the Yodal which was a chocolate encased log of many goodies including chocolate crunch, ganache, honeycomb, nuts and freeze dried strawberries. This was all doused with a silky chocolate sauce. Suffice to say, this was sweet, yet a wonderful study of textures. In fact, the entire meal was very good and fairly interesting. Prices were definitely fair for the quality and overall restaurant experience. Good thing to see that Juniper & Ivy lived up to the Top Chef hype.